THURSDAY MORNING COFFEE – Small world, or karma? A flood of memories washed over me at that moment. I stood at the counter, poised with a pen with my hand, my mind racing back whole decades. When I was a teen in the early 1980’s, I’d trained at an aikido dojo in New Jersey. The local schools did a lot of visiting back and forth back then, both to share ideas and to keep practices interesting. Our school had been visiting a school in southern New Jersey, founded by Richard and Kathy Crane (http://www.aikidoagatsudojos.com/Aikido_Agatsu_Dojos_New_Jersey/Home.html). We all clustered around a television after practice to watch some aikido videos. 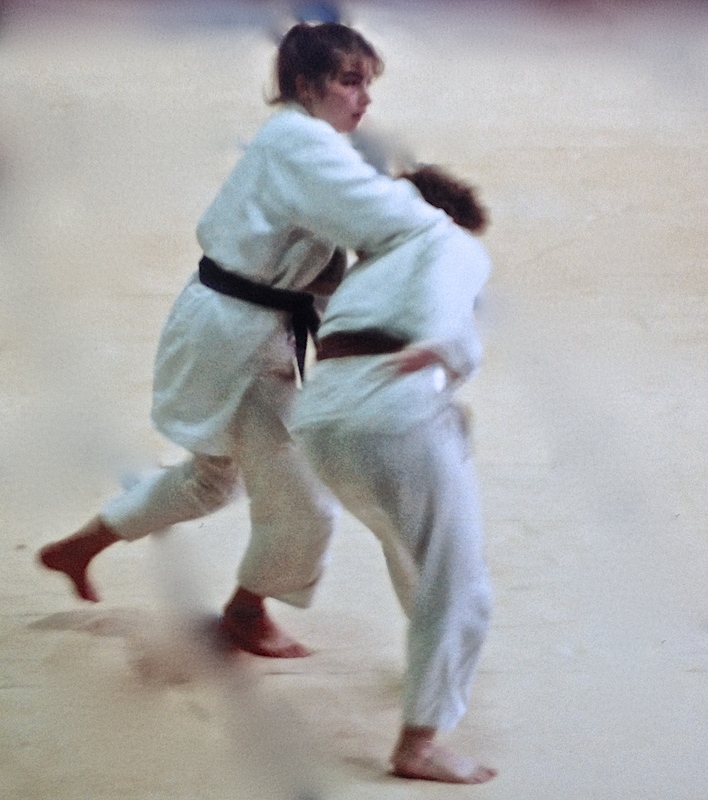 VHS tapes were new at the time, and being able to film and share footage of martial arts technique was a valuable study tool. The Ruriko-san from whom my daughter is learning today looks a lot different than the woman in the video: decades older, short-haired, doing the best the best her body allows. She wears comfortable pants, a t-shirt, and Pittsburgh Steelers earrings. Yet, she’s short, and her age is about right. I fought my curiosity as we sat in chairs by the mat and watched the practice. Ruriko Masutani sensei called out an occasional suggeston to her black-belt students, who taught the class. She laughed at the antics of the younger set that worked on evasive movement while sliding past “cuts” executed by their adult instructors with brightly colored pool noodles. She cheered on the young boy who worked hard to throw an experienced adult. During a lull in the action, I leaned over and asked whether she’d ever been filmed. “No. Just pictures,” she said. “I remember a video. It was a long time ago, in the early eighties.” I described it and gave her a time frame. She searched her memory, and finally her eyes lit up. “There was something, long time ago,” she said. “They told me only afterwards I was on film. We did a lot of demos, it was probably one of those.” She smiled. “Hard to believe that you are here, from far away, and you saw my video. Such a long time ago. I was young! And my hair was down to here!” She patted her rear. And thus I’m on a quest to locate an old video of the young and incredibly graceful Ruriko Masutani. It’s floating out there somewhere, just like she had floated over the mats back then as men twice her size kept falling by her feet. If any of you where to find it, please contact me. Masutani-sensei has never seen it, and would like a copy not only for herself, but also for her students who all seem to be half her age and younger. The old women in my life have passed on, but one was delivered on the wings of fate, along with a rush of ancient memories. Life is so amazingly interwoven, and the world can be so small. I am grateful to get to know the amazing and graceful Ruriko-san in her older iteration. She was happy to hear the story, too. So happy, I even got a hug. This entry was posted in personal experience, Thursday Morning Coffee Blog and tagged #writerproblems, aikido, Aikido Agatsu, aikido demo, Aikido of Pittsburgh, breakfall, coincidence, generations, japanese film, karma, Kathy Crane, martial arts, old film, Richard Crane, Ruriko Masutani, video, video heritage. Bookmark the permalink. 1 Response to THURSDAY MORNING COFFEE – Small world, or karma? I agree she that Masutani sense is a great teacher. I truly enjoy her presence in the Dojo when we practice and even more when she gets on the mat and imparts her knowledge.